In the first post of the series covering 2Q national Accounts data, I dealt with sectoral composition of growth. The second post considered the headline GDP and GNP growth data. The third post in the series looked at Domestic Demand that normally more closely reflects true underlying economic performance, and the fourth post covered external trade. In this post, let us briefly consider per capita GDP, GNP and Domestic Demand. Chart below shows cumulative four quarters per capita GDP, GNP and Domestic Demand based on the latest data for population estimates and the National Accounts through 2Q 2015. As shown above, Final Domestic Demand on per capita basis was at EUR33,782, up 5.95% y/y in 2Q 2015, closing some of the crisis period gap. 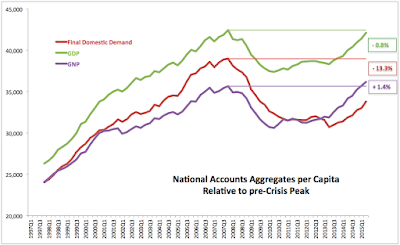 Still, compared to peak, per capita Final Domestic Demand is still 13.3% below pre-crisis peak levels in real (inflation-adjusted terms). In part, this is driven by the Personal Consumption Expenditure which, on a per-capita basis was EUR19,163, up 2.1% y/y in 2Q 2015, but down 8% on pre-crisis peak. GDP per capita rose 5.3% y/y in 2Q 2015 to EUR42,106, down only 0.82% on pre-crisis peak. GNP per capita rose to EUR36,189 up 5.9% y/y and 1.49% ahead of pre-crisis peak. CONCLUSIONS: With GNP per capita attaining pre-crisis levels back in 1Q 2015, the recovery from the crisis has been effectively completed in real terms in terms of GNP after 28 quarters. In GDP terms, we are now close to regaining the pre-crisis peak levels, with 30 quarters to-date at below the peak. 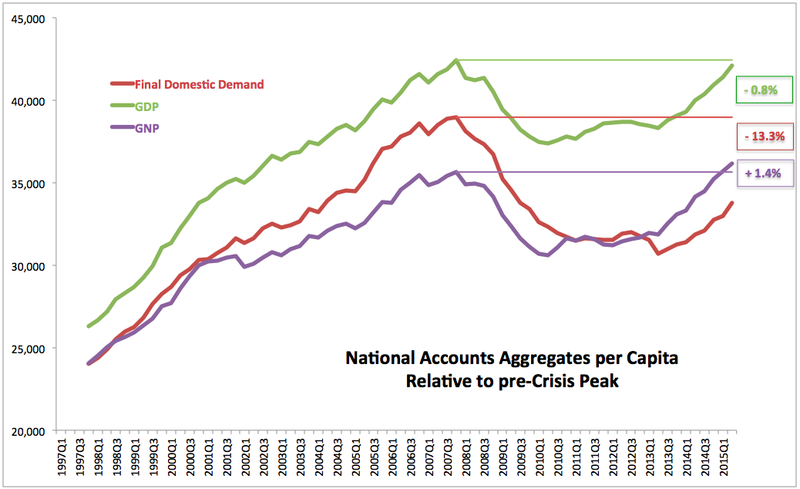 However, recovery is still some distance away in terms of Final Domestic Demand per capita and in terms of Personal Consumption Expenditure.